Can NYSERDA Make Offshore Wind Projects in the US More Like Europe’s? The state agency bids on an upcoming auction to drive down costs and construction timelines. A few months ago, a survey of wind experts published in Nature Energy found that the levelized cost of energy for onshore and offshore wind could drop another 25 percent by 2030. For European offshore wind, that price drop is coming sooner rather than later. It’s a longer road in the U.S., since the American offshore wind market is nearly nonexistent. But one state bidder in an upcoming offshore wind auction is trying to make the process more like Europe's in order to establish a viable market and drive costs down. The New York State Energy Research & Development Agency is one of a dozen bidders in the upcoming offshore wind auction for a site 12 miles off of Long Island. NYSERDA is betting that it can perform the functions that governments often assume in Europe to make burgeoning U.S. offshore wind projects cheaper than they’d otherwise be, even if it won’t be able to deliver projects as cheaply as those Europe has seen of late. The European offshore wind market is robust, with more than 11 gigawatts spinning in the chilly waters off of northern Europe. The average offshore European wind farm is about 350 megawatts. 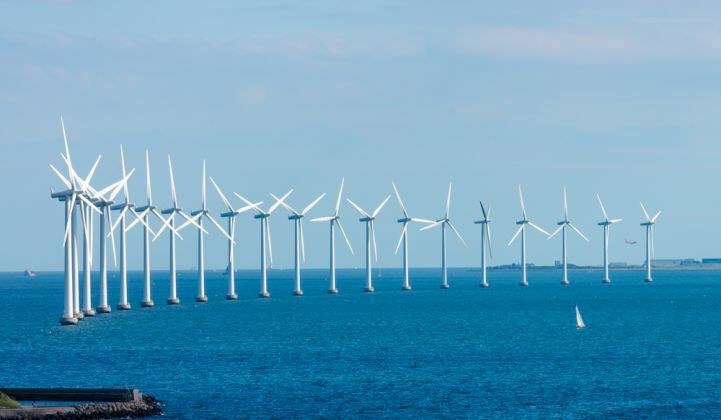 Vattenfall recently won a contract for 350 megawatts of offshore wind off the coast of Denmark at a startling $63 per megawatt-hour. Until recently, prices were still over $100 per megawatt-hour for offshore projects. The Vattenfall bid was not just a one-off, however. Earlier in the year, Dong won an auction for a Dutch offshore wind farm at $77 per megawatt-hour. Over in Europe, the lower costs are not just due to project sizes and increasingly larger turbines. In the case of the Vattenfall Danish project, the Dutch government paid for key elements of project development and took on the risk for the transmission connection. That construct is quite common in Europe. By having the government involved, it helps de-risk the project for the winning developer and streamlines the site work. In the U.S., however, there are two parts to offshore wind projects. First, the developer needs to secure the acreage from the U.S. Department of Interior's Bureau of Ocean Energy Management (BOEM). Then, the developer has to secure a power-purchase agreement. He noted that a lot of the site characterization work could be done by NYSERDA, particularly the environmental studies. Then, NYSERDA would auction off both the acreage and an offtake agreement to a developer, as it is usually done in other parts of the world that are building offshore wind. “There needs to be a lot of offshore wind, and we’re not going to do a lot of offshore wind unless it’s cost-effective,” said Rhodes. NYSERDA worked with Danish consulting firms to craft its auction bid and consulted with developers about their potential involvement in developing the site. Although various developers are also bidding in the auction, there is general support for NYSERDA’s involvement. "We applaud Governor Cuomo’s visionary leadership in renewable energy and NYSERDA's plans to participate in the upcoming BOEM auction for the site off the Rockaway Peninsula,” Jeffrey Grybowski, CEO of Deepwater Wind, said in a statement. It’s hard to say just how much quicker and more cost-effective it could be to have NYSERDA leading the charge for offshore wind, but “it has the potential to significantly bring down cost,” said Warren Leon, executive director of the Clean Energy States Alliance. The risk to NYSERDA is that once it has made the investment in the site, developers may not come in with bids that match the investment they’ve made. However, the federal government is offering a 10 percent credit to any government authority, like NYSERDA, willing to bid on the offshore auction. For New York, it’s a risk worth taking, especially as the state is looking to get 50 percent of its electricity from clean energy by 2030. The National Renewable Energy Laboratory has found New York has the potential for about 39 gigawatts of wind power off of its coast. The site off Long Island is nearly 80,000 acres and could host approximately 800 megawatts of wind, which would rival some of the largest offshore wind farms in the waters off of Europe. The scale of the project alone would certainly bring down the levelized cost of energy compared to smaller projects such as the Block Island Wind Farm, which is only a handful of turbines. Even if NYSERDA does not win, it wants to be readily involved in New York’s plans for offshore wind. On Monday, the agency put out an RFP for expert consultants as the state finalizes its offshore wind master plan. "NYSERDA is looking to engage the very best thinking and expertise from the most experienced and knowledgeable experts," said Rhodes. Proposals are due by January 12.